Most people are probably unhappy with the Facebook auto video playing on their timeline. This will also consume your internet bandwidth and it is annoying. Today I am going to show you on how to remove this feature your account settings. 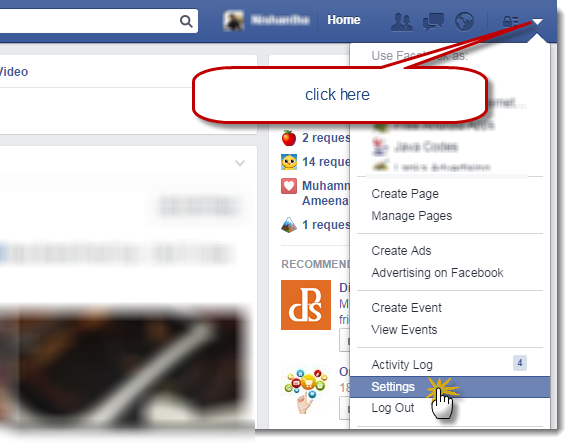 For doing this, login to your Facebook account and click on the arrow icon in the right upper corner as shown in the below figure. And click on the settings in the drop down list. Here, you can see videos in the left lower corner of the webpage. Click on videos and you will see Video Settings. And select off from the drop down box in Auto-Play Videos.